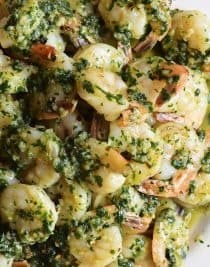 Easy Garlic Shrimp Recipe – This garlic shrimp recipe is ready and on the table in 15 minutes! 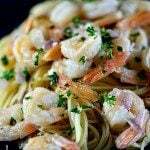 It’s an easy shrimp recipe so perfect served with pasta, cheesy grits or on it’s own. 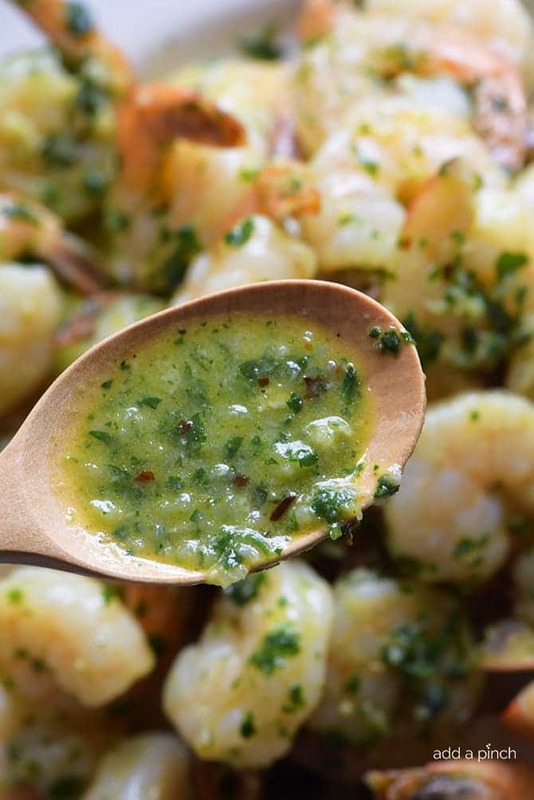 This garlic butter shrimp is a delicious favorite! 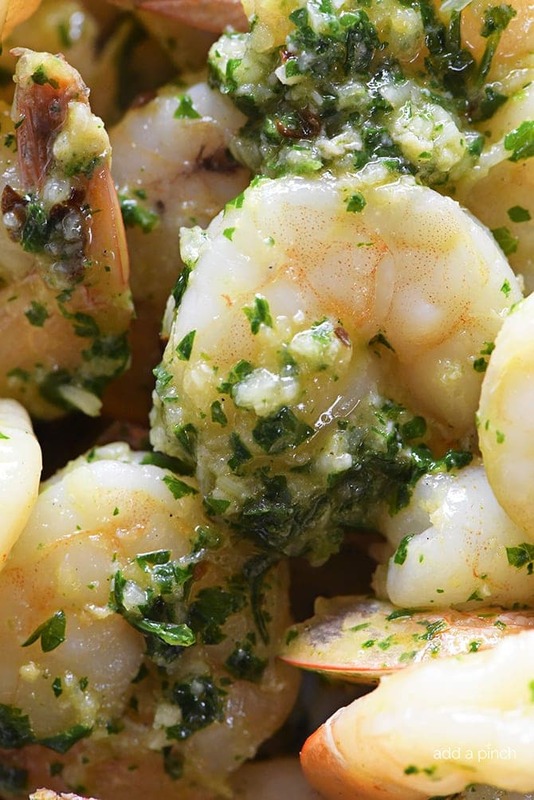 I love quick and easy recipes like this garlic shrimp. Simple, scrumptious and sublime. It is one that I turn to time and again when I need a simple weeknight recipe for supper in a hurry and I love how versatile it is! It is scrumptious served with a side salad, over roasted asparagus, with zucchini ribbons, cooked pasta, or even on top of a bowl warm, cheesy grits! But you guys, it is pretty amazing just right on its own! As a matter of fact, it is one of those dishes that I have to be sure not to let myself have more than one as I taste test before serving. It is pretty easy to just keep right on with one more, and another, and then another. That’s when you know the recipe is good! And thankfully, it couldn’t get much easier to make! 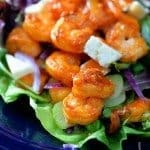 This garlic shrimp recipe is also great to serve for lunch with a side salad or even as an appetizer with hunks of crusty bread to dip up all of that delicious garlic butter pools underneath the shrimp. It definitely makes for a comforting dish when you serve it that way. I like to just serve right from the skillet with a basket of the bread right beside the skillet so that everyone can just dig right in. For the shrimp, if you use frozen, just make sure they are fully thawed and then rinsed well and drained. 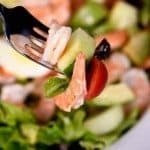 Fresh Gulf Shrimp – I love to use fresh Gulf shrimp as much as possible. 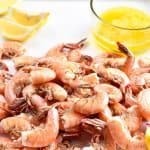 Frozen Shrimp – If you use frozen shrimp, make sure that it is fully thawed and then rinsed well and drained before cooking. 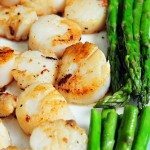 For the garlic, I’ve tried various amounts of garlic to shrimp ratios and found that we all prefer 6 medium sized cloves of garlic minced. You can certainly adjust the amount of garlic up or down based on your personal preferences. The pinch of red pepper flakes is completely optional, but I think it adds a depth of flavor to the garlic shrimp. If you do not like or can not have spices, simply omit it. It will still taste delicious! 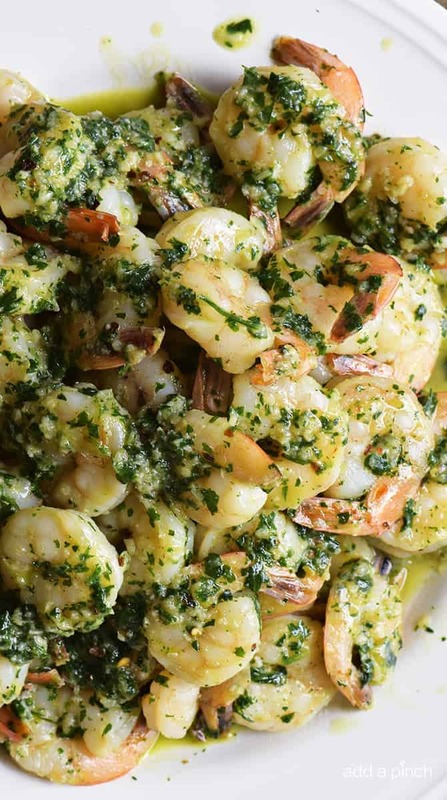 Also, the chopped parsley adds a fresh flavor to this garlic shrimp that we just love. It also adds color and makes the shrimp prettier! 🙂 I just love that it also adds a slight green hue to the butter. Buttery, with a hint of heat from the red pepper flakes, I especially love that this garlic shrimp is one of those dishes that I can make week in and week out without a single complaint from my family. Don’t you love recipes like that? 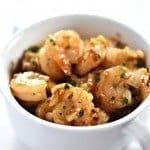 Here’s my Easy Garlic Shrimp recipe. I hope you love it as much as we do! Easy Garlic Shrimp Recipe - This garlic shrimp recipe is ready and on the table in 15 minutes! 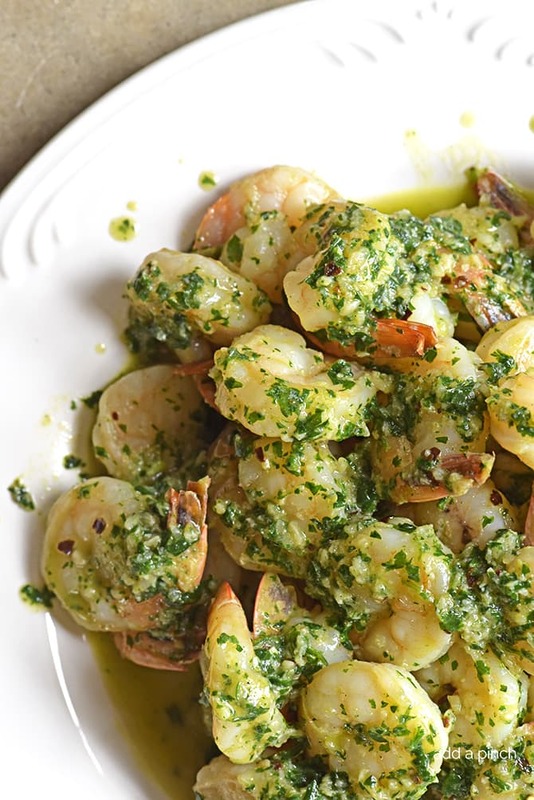 Perfect served with pasta, cheesy grits or alone, this garlic shrimp is a favorite! Melt 1 tablespoon of butter in a skillet set over medium-high heat. Add the shrimp and cook, stirring often until it just begins to turn pink. 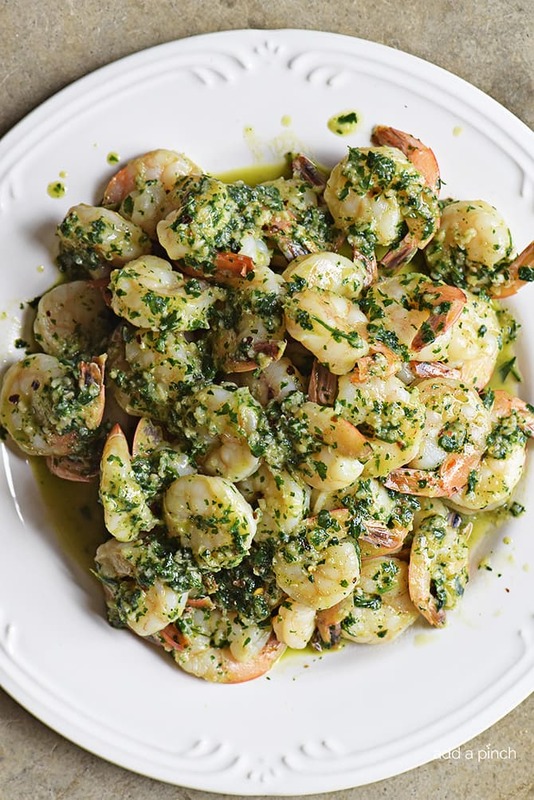 Stir in the minced garlic, lemon juice, remaining butter, red pepper flakes, and the parsley and continue to cook until the shrimp is fully pink and opaque about 3 minutes. Mmmmmm! I can almost smell it from the photos. I want a fork and some linguini to dig right in. Looks super simple to whip up on a weeknight. Yum! 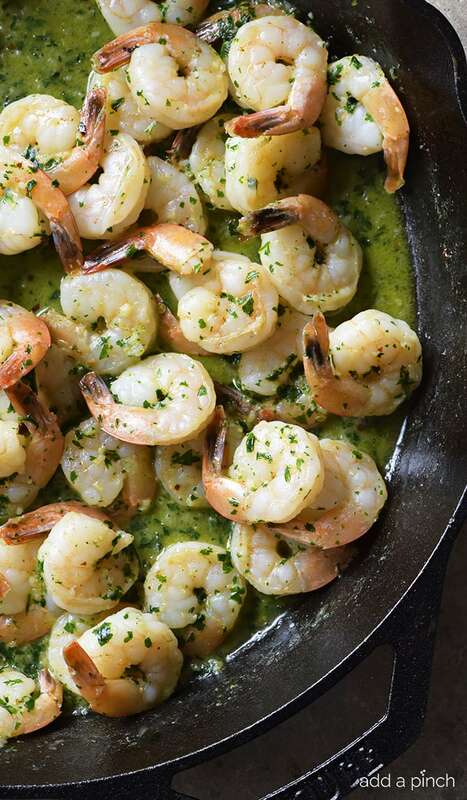 I just love shrimp with garlic and this dish looks so delicious! Thanks for sharing another great recipe, Robyn! Thanks so much, Asiya. I appreciate that very much and hope you enjoy the recipes! I had the house to my self this weekend and decided I would cook all the things I love. since my family are philistines. who would eat nothing but hamburger if given the chance!! I made this for my dinner Saturday night curled up in a chair with a great movie to watch. Now I am not a big eater but it was all gone long before the movie ended along with almost half a loaf of Toasted Buttery Garlic Bread, Good thing they don’t go away often!! What are your thoughts on substituting lime juice and cilantro for the lemon juice and parsley? I’ve not used those in this particular recipe, so I can’t say, but I do use those in other shrimp recipes and it’s delicious. Thanks Robert! I just happened to have frozen shrimp in the freezer and we had this for dinner! Delicious! Thanks! If you don’t like parsley, you could try basil. Or you could just leave out the herbs altogether. Hope this helps!